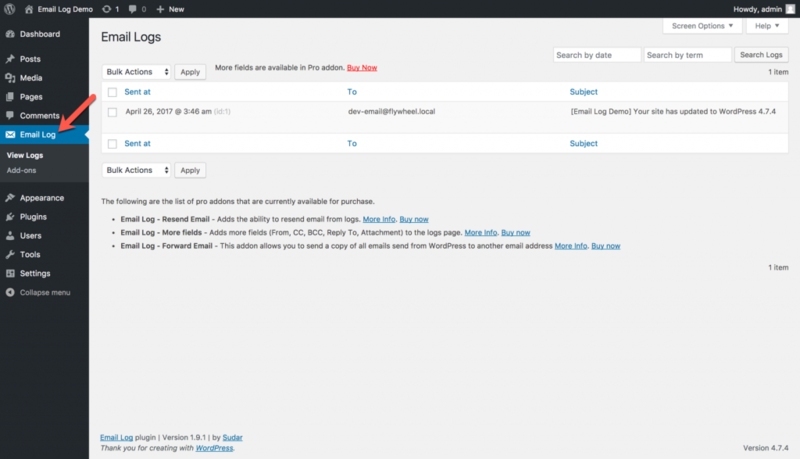 To view the logged Emails, hover over to the Email Log menu in the WordPress dashboard. Click on the 'View Logs' menu, to view the logged emails. ‘View Logs’ page is very similar to WordPress posts/pages except that all the logged emails are listed. You can use the 'Bulk Actions' from the 'Bulk Actions' drop-down, as you would use on Posts/Pages. The Email Log WordPress plugin allows you view basic email information like – 'Sent at', 'To' & 'Subject'. You can view additional information on the emails, like – 'From', 'Cc', 'Bcc', 'Reply To' & 'Attachment' by using our More Fields add-on. Check out the More Fields add-on documentation on how you can install and use the add-on. Additionally, you can search the logged emails. Email Log supports both HTML and plain text view modes, to preview the logged emails.